Attention is paid in particular to the thermodynamical frame for solid materials modeling at the macroscopic scale and its applications, as well as to the particular use of such alloys – the simplified calculations for the bending of bars and their torsion. Other chapters are devoted to key topics such as the use of the “crystallographical theory of martensite” for SMA modeling, phenomenological and statistical investigations of SMAs, magneto-thermo-mechanical behavior of magnetic SMAs and the fracture mechanics of SMAs. Case studies are provided on the dimensioning of SMA elements offering the reader an additional useful framework on the subject. 1. Some General Points about SMAs. 2. 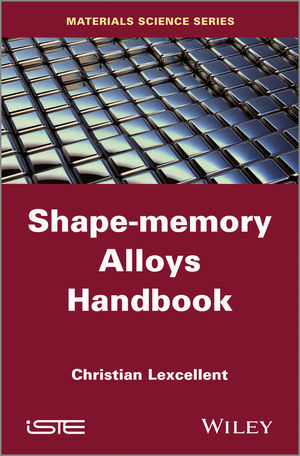 The World of Shape-memory Alloys. 4. Thermodynamic Framework for the Modeling of Solid Materials. 5. Use of the “CTM” to Model SMAs. 6. Phenomenological and Statistical Approaches for SMAs. 7. Macroscopic Models with Internal Variables. 8. Design of SMA Elements: Case Studies. 9. Behavior of Magnetic SMAs. 10. Fracture Mechanics of SMAs. Appendix 1. Intrinsic Properties of Rotation Matrices. Appendix 2. “Twinning Equation” Demonstration. Appendix 3. Calculation of the Parameters a, n and Q from the “Twinning” Equation. Appendix 4. “Twinned” Austenite/Martensite Equation. Christian Lexcellent is Emeritus Professor at the École National Supérieure de Mécanique et des Microtechniques de Besançon and a researcher in the Department of Applied Mechanics at FEMTO-ST in France. He is a specialist in the mechanics of materials and phase transition and has taught in the subjects of mechanics of continuum media and shape memory alloys. He is also a member of the International Committee of ESOMAT. Professor Christian Lexcellent U.F.R. Sciences and Technics, Laboratory of Applied Mechanics, University of Franche-Comté, Besançon, France.